An iPhone ecard app that gets it right. Yeah, yeah, yeah, I know that I’m supposed to jot off a thank you note before the wrapping paper hits the ground, but I usually forget. Or worse, I don’t and it just nags at me. Solution: a great instant card iPhone app that looks more fantastic than any we’ve seen before. The Red Stamp app hails from one of our long-time favorite online card shops, Red Stamp so it’s not surprising that the designs aren’t secondary to the technology. They have a stylish gallery of design templates and you can customize the message to suit the situation. 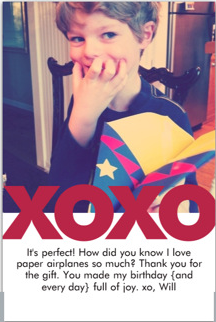 From “Thanks for fish-sitting,” to a sweet love note just because. Although in truth some of the pre-written messages (done by etiquette experts) were far better than anything I could come up with. Me, not being an etiquette expert. Now what I think is especially cool about this app is that you can easily pop in photos–like say your child wearing the hand-knit sweater he received for his birthday–and then just email it, post it on Twitter or Facebook, or send it in an instant message to the gift giver. The Red Stamp app from Red Stamp Cards is $.99 and is available for iPhone, iTouch, and iPad at the iTunes store. 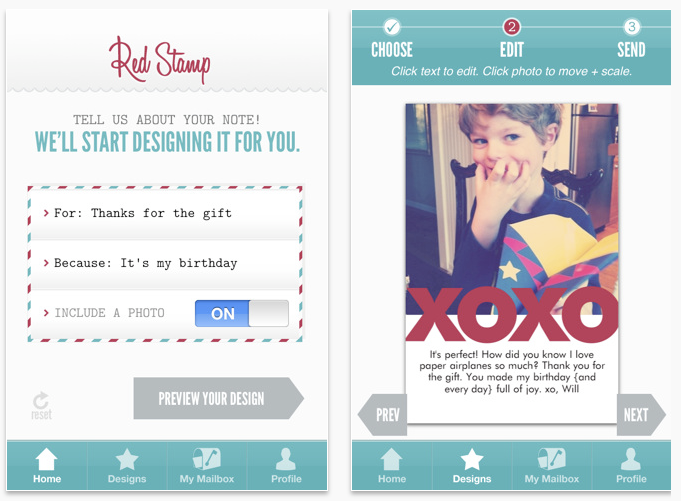 **Edited to add 3/26: For a limited time, the Red Stamp app will be totally free! Enjoy! Excellent. Just used for last night’s dinner party TY. Love, love, love the stuff you ladies come up with!! What a great job!! Thank you! Love it! Just what every busy, but thankful and well intentioned, mom needs!! I bought it too and it’s very good. No version for android? Are you aware of anything similar? I really want this. It will help redeem my reputation among my card loving inlaws! The Red Stamp folks assure us they’re hoping to do Android next. In the meanwhile we’ll keep our eyes out! Android is still lagging behind iOS in the cool app dept but we’re always looking.